Now you can have a second chance at selling to your exit traffic! If you've been following the Internet Marketing scene the past few months, you may have noticed the growing popularity of "exit" scripts that pop-up when a visitor is just about to leave, displaying a last effort message in order to save the visitor from leaving. Most of the time, a coupon is offered or a reminder of free bonuses, but they aren't very pretty and don't appeal to everyone. So why is Virtual Sales Bot different? Virtual Sales Bot captures the visitors attention by actually opening a chat window with the visitor and starts up a conversation with them...interactively! Here is an example screenshot of a Virtual Sales Bot! You control the conversation text that the visitor will read. You control the name of the "sales agent" the visitor is "chatting" with. You control the time delays when the text appears. You control the "replies" that are displayed to visitors that mistake the "bot" for a human. Note: All of this can be done with a simple text editor on a PC or MAC. By the way, did you catch that last bullet point? You can actually control the "replies" that a visitor will read if they accidentally mistake the bot that is chatting with them for a real human. Virtual Sales Bot will randomly choose a reply from your list and actually answer the visitor's question or comment. To see for yourself, move your mouse cursor as if you were going to close your browser or click the back button, wait for Virtual Sales Bot to pop-up, then start chatting! VSB will randomly choose a reply and answer your chat questions or comments. 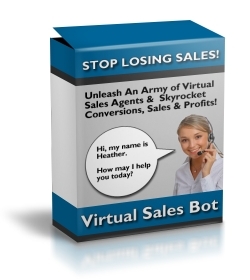 Virtual Sales Bot is a powerful, easy to use software you can use to set up your own personal exit traffic army of virtual salesmen. As soon as VSB gets a sense that someone is about to abandon your site, it jumps into action, giving your visitors a second chance to interact with your site and take action on your offers! You can add unlimited sales bots and put them on any webpage you want. Simply add one block of code to your webpage and your sales bot is ready to go to work for you! Adding a Virtual Sales Bot to your website is extremely easy and only takes a couple of minutes! If You Can Click, Copy, and Paste, You Can Use Virtual Sales Bot! There's NO Complicated Programming & NO Database Needed! Using a text editor, you edit one file that contains the name of your sales bot and the responses you want your sales bot to say to your visitors. Upload all the "Virtual Sales Bot" files to your website. Add a small block of code to the webpage you want your sales bot to work on. That's it! In 5 minutes or less, you can increase the profit potential of any webpage! when you start using 'Virtual Sales Bot' today! Slash Website Abandonment - Grab your visitors attention just before they leave and entice them back into your site with a new offer! Increase Visitor Value - Increase the dollar value of each of your customers by converting and selling more often! Boost Conversions - Convert more visitors into buyers by giving them a special discount or coupon code just before they leave your site! These people were about to leave forever and spend nothing, but Virtual Sales Bot can save them! Lighten Customer Support - Address some of the most common questions potential buyers have! Motivate Potential Affiliates - Put an virtual sales bot on your affiliate recruitment page reminding affiliates about competitions or special prizes you may give out for top affiliates! Reiterate Important Bonuses - A big selling point of many offers is the bonuses that are included. Now you can make sure your visitors know the value of your bonuses by reminding them of one last time before they go! Up-sell & Cross-sell - Up-sell or cross-sell related products while your customers are in 'buying mode'! Instant Support - Your visitors want immediate satisfaction and Virtual Sales Bot delivers that to them while you are asleep! You can put your new 24 hour sales force to work on any webpage in https://www.tradebit.com will work for you everyday, regenerating your traffic and channeling it back into your sales funnel. P.S. Once you start using 'Virtual Sales Bot', I know you're going to love it. Let me know your experiences so I can put up a few testimonials on this site.